Hamm: C’mon, let’s go see how much we’re going for on EBay. There comes a point in every boy’s life when he has to grow up. Ok, fine. There are many points in a boy’s life when he must do this but going off to college is certainly an undeniable turning point. You leave behind your family, your friends and the only home you know, including a chunk of everything you own. For young Andy, a boy we first met when he was just eight years old, leaving for college means putting away all the toys that brought him so many hours of enjoyment back in his day. And so he throws Buzz, Rex, Slink and the rest of them in a bag destined for the attic. 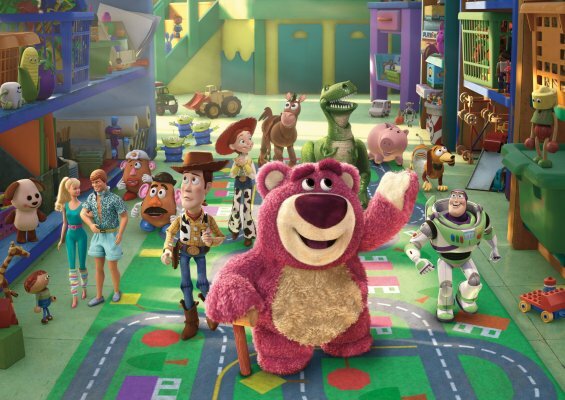 Some have said that after sitting in their own attic, the people at Pixar should have left their very first success, TOY STORY, exactly where they left it eleven years ago. Fortunately for all of us though, the people at Pixar will never fully grow up. The toys are out of the attic and they’re better than ever! Letting go, dealing with new realities, distancing yourself so as to avoid ever getting hurt – these are just a few of the touching themes that are subtly told in TOY STORY 3. The Academy Award winning writer of LITTLE MISS SUNSHINE, Michael Arndt, follows up his first success with what could very likely net him another trophy. Arndt understands that adventure can be subjective – that what might seem small and unimportant to some is the biggest challenge others will ever face. He also understands that adventure is made perilous when those involved have much to lose. For our favourite toys, the loss is particularly significant – they are about to lose their reason for being. Being relegated to the attic means that these toys will no longer be played with, that they will no longer be able to bring joy to their favourite guy, Andy. So as Andy lets go of them, they must learn to let go of him as well. Toys passing the time in the attic might not make for a very exciting film though. (Mind you, if anyone could make it exciting, it would be these guys.) Instead, the toys find themselves donated to a nursery school. Well, most of them anyway; our man Woody (Tom Hanks) was selected to go off to college with Andy but, as luck would have it, Woody seems to have found himself lost and on the loose once again. While Woody tries to make his way home alone, his pals are stuck in nursery hell, where kids play with you for hours, sure, but they also have no regard for these toys because they just aren’t their own. 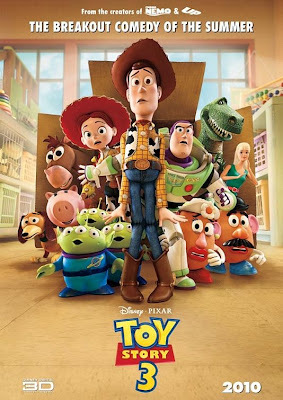 First time full-fledged Pixar director, Lee Unkrich (Unkrich previously co-directed FINDING NEMO, MONSTERS INC., and the second TOY STORY film), ties these two storylines together seamlessly and charges the entire picture with an intensity that never lets up and culminates in a climax so dire that it catches the viewer off guard and triggers an emotional response that cannot be contained. Just ask the guy sitting next to me. TOY STORY 3 is triumphant! It carries the depth and hilarity that one has come to expect from Pixar and then carries it even further still. Even though I say it again and again when I review their films, they are constantly outdoing themselves. Here, they’ve achieved the extremely rare feat of making a threequel a decade after the last installment that actually surpasses both films that came before it. Even though they’re playing with toys, their maturity continues to expand and their visual mastery continues to break their own barriers. Their films work because they have soul. 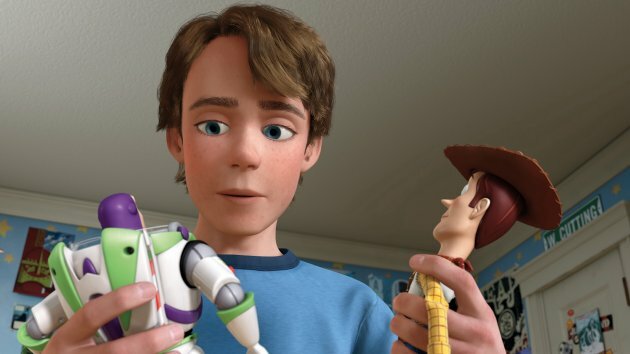 The spirit of TOY STORY lives in that special bond between a boy and his toys. Back when life was simple, they were all we needed and, according to Pixar, we were all they needed too. And by taking these toys out of the attic and doing right by them one more time, Pixar incites that rare and wonderful feeling of nostalgic warmth that one gets all over their body when they find themselves unexpectedly playing again with their favourite toys. How many sheep would you give Toy Story 3? 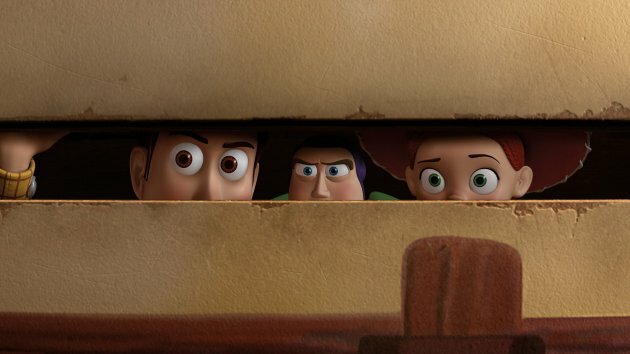 Perhaps one of the most expected film of the period is Toy story 3. After all of us waited 11 age for this outcome, all I can say is: Toy Story 3 is a animated flick, whole with fun and lots of emotion. The 3D maybe overrated(since I saw this in 2D)but relieve the memories of the show is still there. We all object this toy characters, but it is velar to say goodbye of the net business of the trilogy. Couldn’t agree with you more, especially in the fact that Pixar has achieved something rare in creating an unintentional third chapter so very long after the fact. That’s the achievement which might have impressed me most of all about this film…the writing and storytelling and the way it organically stems back to the theme of growing up. And I might have been the guy sitting next to you. Hey Morpheus … I think by saying Toy Story 3 is an animated flick, you might be undervaluing it some. There are moments of sincerity and tension in TS3 that rival and beat most live action pictures. It is a fitting goodbye though. I had to keep removing my 3D glasses and wiping away all the buildup! This is a big graphical evolution, it’s one of the most beautiful 3D animated show!